Other Dimensions: Backless stool measures 13 inches deep, 19 inches wide, and 25 inches tall. A warm walnut finish provides a rustic quality that instantly adds generous texture to the table. Product Description Local Pub. 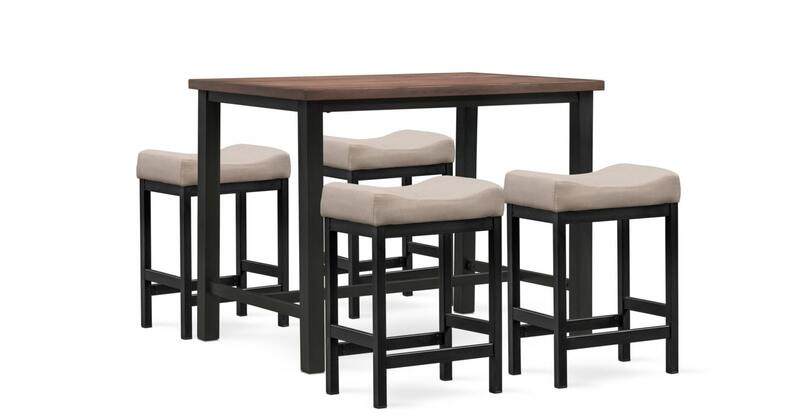 With just the right touch of industrial elements, the Arlo pub set blends modern features with classic textures. Anchored by a rustic walnut finished wood top, this stunning ensemble features a metal base on the counter-height table and each of the backless stools. Constructed using quality materials such as plywood, pine solids and veneers, rest assured you’ll have this set for countless memories. Customer assembly required. Unique Features: Plush cushions that feature decorative seam work are curved to better support. Slim, clean lines and foot rails offer a contemporary vibe. The metal table and stool base creates consistency throughout this set. Construction: Table top constructed of durable plywood, pine solids, and veneers. Strong metal legs guarantee table stability.